Stylize a contemporary space with the sophisticated silhouette of this glass and stainless steel column floor lamp. A modern space is energized with the addition of this stainless steel and glass floor lamp. From John Richard comes a fashionable and functional lamp crafted with an illuminating glass column over a stainless steel base and stainless accents. Sophisticated and tasteful, its finished look includes a round white man-made silk shade and a nickel harp to complete an exquisite decor package. Overall: 70" high. Base is 2" high x 10" wide. Shade is 12" high x 21" wide. Weighs 28.4 lbs. 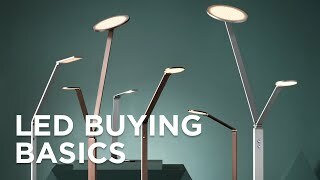 Column floor lamp with energy-efficient LED night light from John Richard. Illuminating glass column. Stainless steel base and accents. Round white man-made silk shade. The Cerno Silva LED floor lamp comes from designer Nick Sheridan and combines a walnut bodybeech shade and brushed aluminum for modern elegance. Perfect for any patio or versatile indoor-outdoor spacethis fish shelf floor lamp is perfect for casting a soft glow and displaying potted plants. This energy efficient &quot;daylight&quot; LED floor lamp from the Koncept brand combines style with advanced lighting and touch dimming technology. Advanced LED technology produces warm light in this sleek Z-Bar floor lampwhich also features a handy one-touch on-off dimming function.